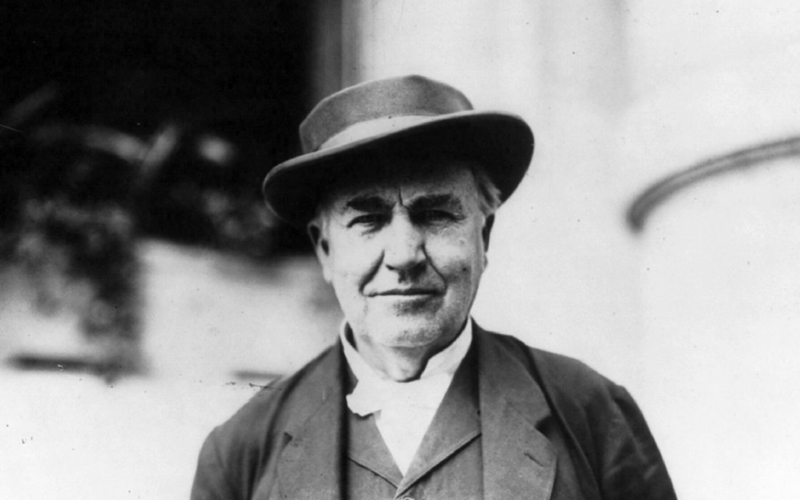 Thomas Edison is one of the most famous scientists in history. He went from experimenting in a box car when he was 10, to starting a large complex of laboratories. There he employed many scientists to work with him, and together they created almost 2,000 patents. 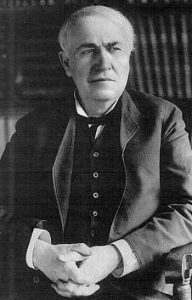 Edison was one of the first people to apply the principles of mass production and large-scale teamwork to inventing. He was nicknamed The Wizard of Menlo Park, and America’s greatest inventor. 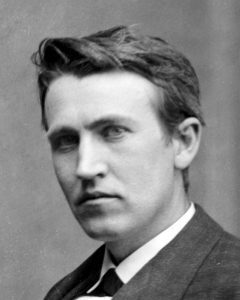 Thomas Edison didn’t do too well in school and his teachers were convinced he had some sort of problem. He had an insatiable curiosity but had trouble concentrating on one thing at a time, his teachers even said he was addled. When his mother found out he the teachers thought he was addled, she became outraged. His mother was a teacher and decided that from then on she would home school him. In this new environment Edison thrived. His mother taught him about maths, and science, and by the age of 10 he became smart enough to build his laboratory. He also set up a printing press, and by the age of 12 had started his own newsstand. 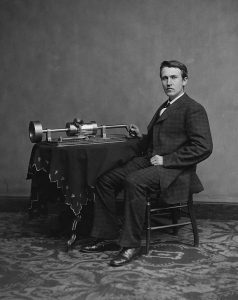 Thomas Edison was actually deaf, although not from birth. He began to lose his hearing around age 12. Edison claimed it was because a train conductor injured him. Apparently he set a boxcar on fire while doing an experiment. The boxcar is actually where he built his laboratory. It’s most likely that it was just a hereditary problem, since other relatives had it as well. Being next to a railroad however, Edison enjoyed being deaf. It made it easier for him to concentrate on his experiments. While at the Grand Trunk Railroad Edison saved a young boy from dying. He was spending time around the railroad when they suddenly noticed a three-year-old boy in a runaway boxcar, about to be hit by a train. Edison rushed over and saved the boy from dying. 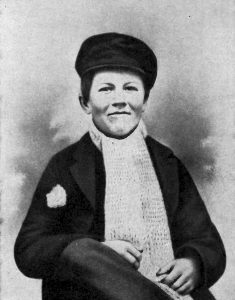 The boy’s father was grateful and in return taught Edison how to use a telegraph. This allowed Edison to become a telegraph operator later in life. He made sure to get the night shift so that he would have more time to do his experiments. This turned out to be quite a risky thing to do as one day he accidentally spilt acid which went on the floor, and burnt through onto his boss’ desk below. He was fired not long later. The phonograph was the world’s first sound recorder. Edison tested it by reciting Mary had a little lamb, and then the machine played it back to him. While working on the telephone Edison discovered that he could record sound on tinfoil-coated cylinders. The invention included two needles, one for recording and one for playback. If someone were to speak into the device the vibrations of their voice would be pressed onto the cylinder by the recording needle. It’s thanks to Edison’s invention of the phonograph that we have music players, film with sound. 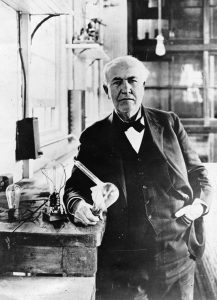 Thomas Edison is most famous for inventing the light bulb. Of course there were things similar to the light bulb already around, but they were pretty much useless. These electric lights were expensive and didn’t work very well. Edison invented the first light bulb that could last hours, it was more practical and cheaper. He created a vacuum inside the bulb and ran a lower voltage through it. Edison also invented the first electricity distributing company in America, and called it the Edison Illuminating Company. So he not only invented the first light bulb that was useful but made it so that more people had access to electricity. 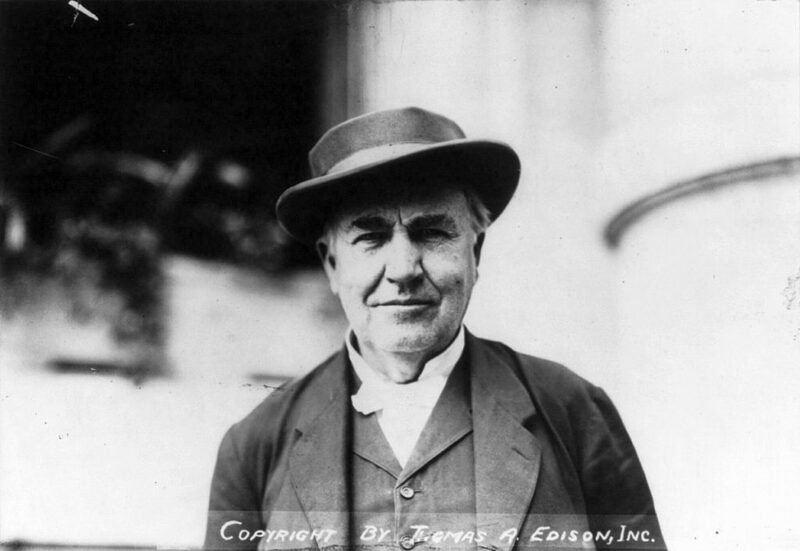 Edison started up an invention factory in 1876 in New Jersey. The complex included chemistry, physics, metallurgy laboratories, a machine shop, a pattern shop, a research library, and rooms for experiments. Here he employed an army of scientists who were constantly inventing. Edison had 1094 patents to his name, most of which were made in the factory. The inventions made here transformed the world we live in. Without these inventions life would be significantly less advanced than they are now. Some of the things he invented were a bit far fetched though, like the spirit phone, and the undersea telegraph. Edison was a big supporter of clean energy. He was very interested in wind and solar energy. 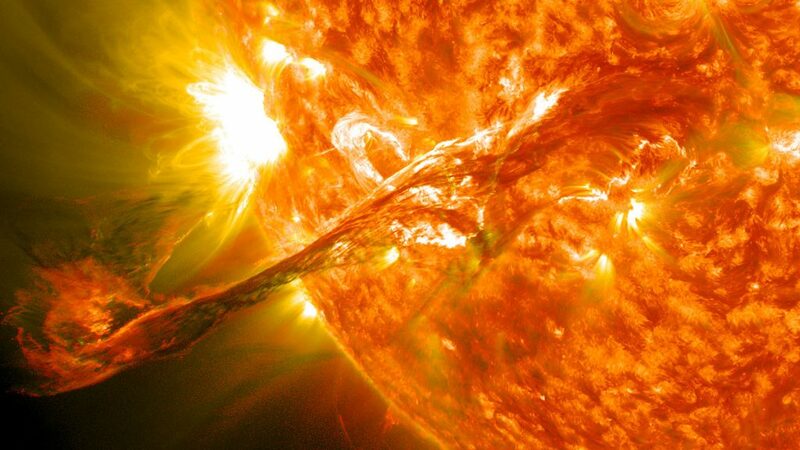 He even said that it would be a shame if we waited until coal and oil ran out before we started work on solar and wind energy. Edison even worked on small wind powered electric generators. In 1912 Edison unveiled a new home completely powered by clean energy. Edison had a mysterious tattoo on his arm. It was five dots, four making up the corners of a square, and one in the centre. 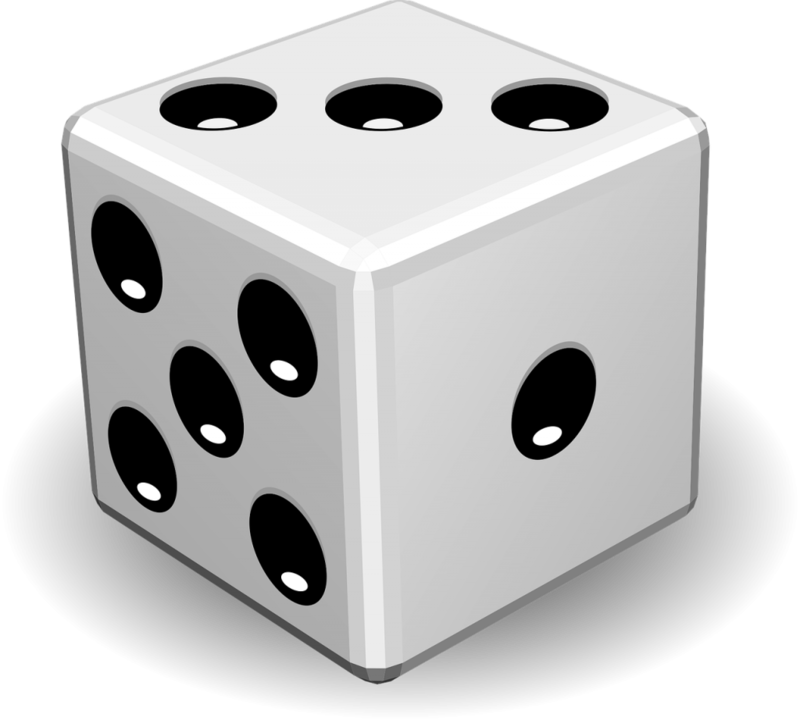 This is known as a quincunx, like the symbol representing 5 on a dice. Because Edison invented an early version of the tattoo pen, some people suggested he may have done the tattoo himself. But nobody knows whether that’s true or not. Both the meaning of the tattoo and how he got it are a mystery. One of Edison’s inventions killed his assistant when experimenting with x-rays. Clarence used to test the x-ray tubes on himself, because he didn’t know they were dangerous. Eventually the exposure led to him getting cancer. He started having problems with his hand that couldn’t be healed. Eventually he resorted to having his hand amputated. He lost the use of both of his arms and eventually they were amputated as well. He eventually died because of the cancer. 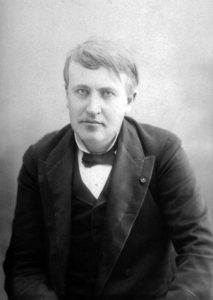 Edison actually proposed to his second wife through morse code. This was quite a few years after his first wife died in mysterious circumstances. Edison married his first wife Mary Stilwell in 1871. They stayed happily married for thirteen years, although Edison did lament her inability to invent. “Mrs Mary Edison My wife Dearly Beloved Cannot invent worth a Damn! !”, he wrote in his diary. In 1884 she died of a possible morphine overdose, but it’s unsure what actually happened. 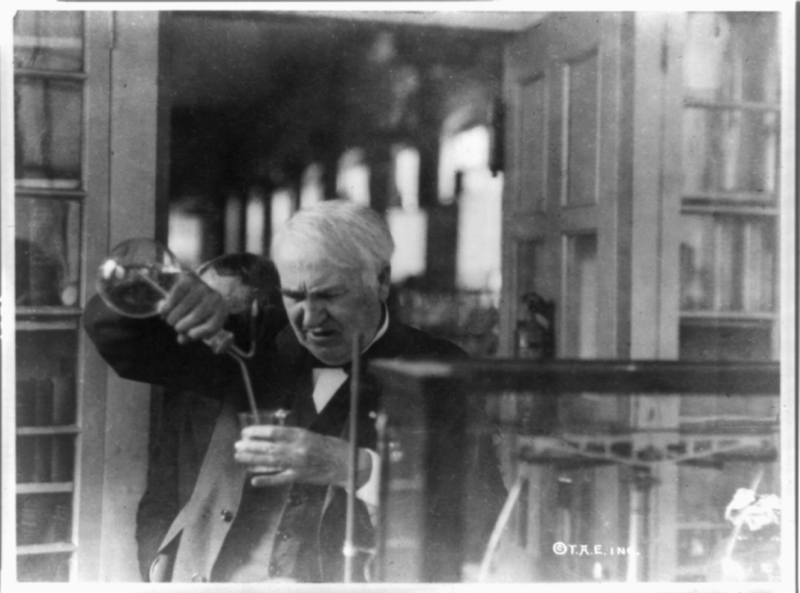 It’s possible that after she died Edison tried to revive her with electricity. Two years after she died he married a women named Mina Miller. He made sure to teach Mina morse code, so they could communicate around family members in secret. He used morse code to propose to her and she said yes.